Denim was the fabric of the 70s and flared jeans were worn by men and women, and were often unisex. However, flares did not begin in the 70s and by the end of the decade they were far from fashionable. Flared trousers and flared jeans came into fashion in the late 60s. The more hip menswear stores were offering flares as early as 1967. You could choose flared or straight legged jeans in the late 1960s. Flares went with the more flowing freer look adopted by the hippies. They used the term 'loon pants' to describe exaggerated flared trousers in the late 60s and early 70s. Flared trousers were nothing new even in the late 60s. In the 30s, women on holiday took to wearing brightly coloured beach pyjamas, flared from the knee. The 70s though, was the decade when flares became mainstream fashion. From 1970, C&A, a store which was seen as a barometer of middle class taste, introduced flares into men's high street fashion. They were by no means universal; the 'cigarette cut' trouser, straight from the knee down, was also popular in 1970. By 1972, flares for both men and women were the height of fashion. 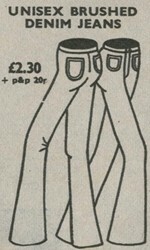 You could get a pair of unisex flared jeans from the small ads column in a newspaper for around �3 in 1972. Ladies could get embroidered patterns. This example, right, is from 1972. Alternatives from the time included velvet loons with a 28" bottom. The classic 70s flared jeans were tight fitting above the knee and flared below the knee. Both the young and the middle aged took to flares in the 70s. A snapshot of teenage fashion in early 1976, before Punk was in the news, revealed flared jeans still essential for boys, but not girls. The 1976 mainstream teenage boys' fashion comprised flared jeans, plimsolls, US college T-shirt, and black bomber jacket. Teenage girls ditched flares in favour of drainpipe jeans, which were popular, originally in the late 50s and early 60s. Flares continued to be mainstream fashion for the 20-plus age group and the majority of teenagers for the remainder of the 70s. 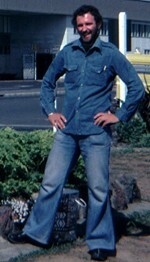 This man, left, photographed in 1977, shows the classic 70s casual look: denim shirt and flared jeans. The young started to reject flares in the final years of the 1970s. Punk had an influence, but some went back to the 50s and sourced ancient peg top trousers from charity shops. Flares were declared dead in the early 1980s. After several failed attempts they returned to the fashion scene in more recent years. More recent trends are seeing a rival of the Punk inspired skinny trouser look, however, the classic 70s look is still available to buy new today. You can find original and new 70s style flared jeans on eBay. "i was born in the early 60's.when i was in middle school,see,1980,flared jeans began to be seen in school yards. teachers,seems hate the style.they ordered us to away from this kind of jeans.together,with my mom and dad. but still ,you can see brush jeans and ciga jeans in the streeat. in mainland china,came with flared jeans,also song from taiwan.i loved best was,and still is ,denglijun,a popular singer then. from then,the love songs began to spreading in china . sorry for my poor english.i learned since then.